Roadway departure crashes are a serious traffic safety concern. These crashes account for about 53 percent of US highway fatalities and one million injuries annually. The Iowa Department of Transportation (DOT) estimates approximately 52 percent of roadway-related fatal crashes in Iowa are lane departures. The Federal Highway Administration (FHWA) estimated in 2010 that 160 fatalities and more than 11,000 injuries related to unsafe pavement edges occur annually. The Safety Edge is a design feature that creates a 30 degree fillet along the outside edge of a roadway during paving operations. The FHWA developed the Safety Edge based on research that indicated a sloped pavement edge surface could be traversed more easily by vehicles attempting to remount the pavement after leaving the paved roadway surface. 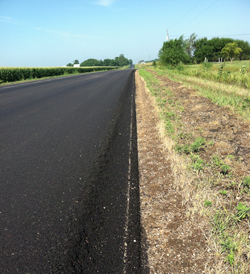 In this Phase II study, researchers observed and documented advances in design and utilization of Safety Edge equipment, sampled, tested, and assessed consolidation of the Safety Edge, inspected field conditions on previously-installed Safety Edge projects, evaluated changes in shoulder settlement/erosion, and assessed any deterioration of sloped HMA pavement edges. Based on observations and measurements, the research team concluded that, even considering that not all results were consistent and didn’t meet the “ideal” 30 degree slope angle, almost all Safety Edge slopes included in this evaluation project resulted in more durable and passable slopes than what would be expected with conventional pavement edges. This Phase II report and tech brief document the evaluation of Safety Edge projects and results in Iowa and include an array of conclusions and practical recommendations.